Artist's concept of NASA's Deep Space 1 probe approaching Comet 19P/Borrelly in September 2001. Deep Space 1, which launched in 1998, was the first NASA craft to use electric propulsion beyond Earth orbit. Deep Space 1 (DS1) was a pioneering spacecraft launched in the late 1990s as part of NASA's New Millennium Program. The primary goal of the spacecraft's mission was to test dozens of new and groundbreaking technologies that were implemented in future missions, such as Dawn and New Horizons. The DS1 spacecraft's technological testing was successful and significantly contributed to decreasing risks and costs for later spacecraft. The mission surpassed expectations by also capturing up-close images of the asteroid 9969 Braille and Comet Borrelly as the spacecraft flew by. Instead of science, DS1 focused on new technology. NASA's goal for the mission was to test the performance of five advanced technologies in flight, as well as another three out of six potential instruments, by Sept. 30, 1999, the end of DS1's primary mission. The agency also planned for the onboard ion-propulsion system to propel the spacecraft into an asteroid-encountering trajectory, during which NASA could assess how the propulsion system interacted with the spacecraft and surrounding environment. Researchers feared that the operation of ion thrusters could contaminate both the science and the engineering portions of a mission, and DS1's job was to reveal how the contamination would work. Required assessment: Each of these had to be evaluated for mission success. Solar electric propulsion (SEP): Also known as ion propulsion, solar electric propulsion offered potentially significant mass savings for future deep-space and Earth-orbiting missions that would require large changes in velocity. Solar concentrator arrays: A high-powered solar array ensured the function of the ion-propulsion system by using 720 lenses to focus sunlight onto 3,600 solar cells to convert light into electricity. Autonomous navigation: The onboard computer controlled the spacecraft and the integrated camera and imaging instruments. This autonomous navigation reduced the signal passing through the Deep Space Network and allowed for small navigation teams during the mission. Miniature integrated camera/spectrometer (MICAS): The visible channels of the camera were used for optical navigation, along with the collection of scientific data. According to NASA's Jet Propulsion Laboratory (JPL), traditional spacecraft at the time would have needed to carry three separate devices to accomplish all of the functions MICAS performed. Small deep-space transponder (SDST): This instrument combined multiple telecommunications instruments into a single, low-mass package that generated the tones needed for beacon-monitor operations. 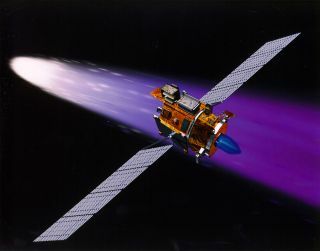 Along with AutoNav and the ion-propulsion engine, SDST was one of the instruments that had to function correctly from the beginning of the mission. Optional assessment: Only three of six required for mission success. Ka-band solid state power amplifier: This small, lightweight amplifier boosted SDST's signal to about four times higher than the standard frequency used for deep-space missions at the time. According to JPL, the amplifier offered "the possibility of sending more information with less power." Beacon monitor operations: This system relayed the overall operation status of the spacecraft to Earth using one of four tone signals. Each tone indicated something different about the spacecraft's health, such as "no assistance needed" or "contact with operators needed within a few days." Autonomous remote agent: This artificial intelligence system planned and executed spacecraft activities and was tested on the spacecraft in preparation for more-ambitious experiments on subsequent missions. Low-power electronics: To help reduce the mass and power consumption of electronics, DS1 carried out an experiment using devices with very low voltage and low capacity. Power actuation and switching module: DS1 carried two power actuation and switching modules, each with four power switches, quadrupling the packing density over what was the state of the art at the time, according to JPL. The switches were used to direct power to the various devices aboard the spacecraft. Multifunctional structure: This device integrated the electronic housings and thermal control of a spacecraft into a structural panel. According to the manufacturer, the technology offered significant mass and volume savings over traditional electronics packaging. Plasma experiment for planetary exploration (PEPE): A miniature integrated ion/electron spectrometer, PEPE combined several instruments into a compact, low-mass package. All 12 pieces of new technology were successfully evaluated, ahead of schedule, by the end of June 1999. Marc Rayman, DS1's chief mission engineer and deputy mission manager, later wrote in his DS1 blog that the mission exceeded his expectations. "I did not even anticipate that we would be able to test all 12 technologies in the primary mission," he wrote. "That is a large payload, and it required a tremendous amount of work to put them through their paces." Following those successful tests, DS1 turned its attention toward the asteroid 1992 KD. Just in time for the spacecraft's flyby of the asteroid, The Planetary Society announced the results of its naming contest, which designated the rocky body as 9969 Braille (the 9969 indicates that this space rock was the 9,969th asteroid to be numbered since the 1801 discovery of the first asteroid, Ceres, which is also classified as a dwarf planet). The name honors the blind French educator Louis Braille, who developed a system of printing and writing used extensively by the blind. DS1's new technology was tested during the spacecraft's visit to Braille. Before the encounter, the target-tracking program in the navigational system had a problem that caused the scientific instruments to point away from the asteroid during the approach. The cameras were shut off during the flyby to allow PEPE to use enough power to collect high-quality data. After passing by Braille, DS1 turned to capture images of the asteroid while moving away. But due to the target-tracking issues, the spacecraft obtained only two black-and-white images of the asteroid's surface and a dozen infrared spectrograph images that helped reveal the asteroid's composition. The spectra showed that Braille is similar to Vesta, the second-largest object in the asteroid belt. DS1's primary mission concluded on Sept. 18, 1999, but after the Braille flyby, the mission was approved for an extension so that the spacecraft could visit a comet. On Oct. 20, 1999, DS1 entered a coasting stage that was to last through mid-December of that year. Along the way, MICAS captured 48 infrared spectra of Mars, covering nearly two full rotations of the planet, from a range of 34 million miles (55 million km). At the time, these pictures were the highest-quality spectra of Mars collected within that range. The images revealed the presence of previously unrecognized surface minerals. On Nov. 11, 1999, after the Mars data had been acquired but before it was sent to Earth, DS1's stellar reference unit (SRU) stopped functioning. The SRU was a component of the navigation system and provided the spacecraft with its only way of tracking where it was in space. Knowing its location was important so that the spacecraft could point its antennas back toward Earth. Although the SRU was considered a critical spacecraft device, there hadn't been enough funding for a backup instrument. But instead of canceling the mission, the team at NASA used the visible channel in MICAS to track a star, then built a program to navigate and operate the spacecraft using the star's relative location. The seven months spent fixing the problem meant that a visit to Comet Wilson-Harrington was dropped, giving the team a few extra months to work out the kinks. Despite the long odds that their solution would work, the DS1 team was able to overcome the setback. "The recovery from the loss of the star tracker was one of our finest accomplishments," Rayman said in a statement. Along the way, DS1 set a new record for the longest operating time of any propulsion system in space. By Sept. 25, 2000, DS1 had logged more than 5,800 hours of operation on its ion propulsion system, breaking the 1970 record of 3,879 hours set by NASA's Space Electric Rocket Test II. This 1998 image shows the Deep Space 1 Technology Demonstrator featuring many new technologies, but none so high-tech as the ion propulsion system. DS1's visit to Borrelly was eye-opening for scientists. As with the flyby of Braille, MICAS and PEPE were key. MICAS captured images of the comet, while PEPE examined the object's composition. Magnetic-field and plasma-wave measurements were made with sensors that had been built to measure the effects of the ion propulsion system on the space environment and that were reprogrammed in flight to collect scientific data. DS1 captured 52 images of the nucleus of Borrelly, using the highest resolution. At the time, only 13 bodies in the solar system had been imaged with better resolution. "It's very exciting to be among the first humans to glimpse the secrets that this comet has held since before the planets were formed," Rayman said in a statement. Sending the data gathered at Borrelly to Earth triggered the conclusion of DS1's two-year extended mission, but that wasn't the end for the spacecraft. Researchers began a second extended mission dedicated to renewed testing of the spacecraft's advanced technology. At this point, the total mission had lasted three times as long as the primary mission, which allowed researchers to gather unprecedented data on the effects of long-term operations in space. Despite its long lifetime, the spacecraft remained undamaged, and scientists considered sending it to another target. A third mission extension would have had DS1 encounter an asteroid named 1999 KK1 in August 2002. However, the DS1 team decided to scrap that plan. "As intriguing as that might have been, it would not have been an efficient use of your tax dollars or mine," Rayman wrote in his DS1 blog. "We squeezed far, far more out of Deep Space 1 than we expected, and now the most responsible way to use NASA's precious resources is to turn our attention to other missions." The spacecraft was reconfigured to allow DS1 to operate indefinitely without hearing from or reporting to Earth. On Dec. 18, 2001, following DS1's last ion propulsion test and the dumping of some final data, team members transmitted a command to place the spacecraft in a safe mode. This final instruction was the 9,905th command of the mission. While it's possible the spacecraft continues to function, attempts to contact it from Earth in 2002 failed. Today, DS1 continues to orbit the sun much like a planet, asteroid or comet. And, it carries with it a time capsule of sorts. In the late 1990s, before DS1's launch, NASA presented information to the Boys & Girls Clubs of America about what humans had accomplished in the preceding millennium. The youth were then invited to write or draw their views of the future. Over 800 of those sketches were recorded on a CD-ROM placed onboard the spacecraft, along with some personal thoughts and hopes of some of the people who worked on the mission. "DS1 will become an inert piece of cosmic flotsam," Rayman wrote. "But perhaps it will be something more than that, as it will remain a monument to humanity's most noble spirit of adventure, sense of wonder, desire to explore, and tenacious creativity." A variety of missions have benefited from the technological tests performed by the DS1 spacecraft. For example, NASA's Dawn mission, which visited the asteroid Vesta and the dwarf planet Ceres, used an ion engine validated by DS1. NASA's Deep Impact mission, which sent a "smart impactor" to the surface of the nucleus of Comet Tempel 1, relied on AutoNav, pioneered by DS1, to help compensate for the comet's unpredictable path. NASA's Stardust mission also relied on AutoNav. The first NASA mission dedicated solely to exploring a comet, and the first robotic sample return mission, Stardust captured dust and samples during its close encounter with Comet Wild 2. A version of the AutoNav software, as modified for the Comet Borrelly flyby, had been uplinked to Stardust to allow it to precisely locate the nucleus of Comet Wild 2. Even rovers have benefited from DS1's technological groundwork. NASA's Mars Curiosity rover occasionally uses autonomous navigation as it treks across the Martian surface. NASA's New Horizons, the first mission to Pluto and its moon Charon, was the first to use DS1's beacon monitor technology. The small deep-space transponder, which combined multiple telecommunication instruments into a single package and was first tested with DS1, has been used on a variety of missions, such as NASA's Cassini and Kepler missions. "Because of Deep Space 1's technology testing, many future missions that would have been unaffordable or even impossible now are feasible," Rayman wrote. "I think that the results of the mission can contribute to a future with more frequent, affordable, capable and exciting space and Earth science missions. Indeed, I've always maintained that the real science return from Deep Space 1 is in the future missions that are enabled by the technologies we tested." Check out images taken by Deep Space 1 in the JPL photojournal. Read more entries in Marc Rayman's Deep Space 1 mission log. Learn more about the revolutionary MICAS instrument tested aboard Deep Space 1.